This cute little doll is made of hard plastic and is marked"ROGARK Made in Gt Britain" on her back. She has painted blue open and shut eyes which tend to stick but can be opened carefully with your fingers. She has complete blue hard plastic eyelashes like the Kader dolls. Her hair is glued on brown mohair. She is wearing her original Scottish outfit which is glued onto her body. She even has a tamashanta hat on her head. Her black shoes and white socks are painted onto her feet with scottish tartan material glued around the top to look like long socks. 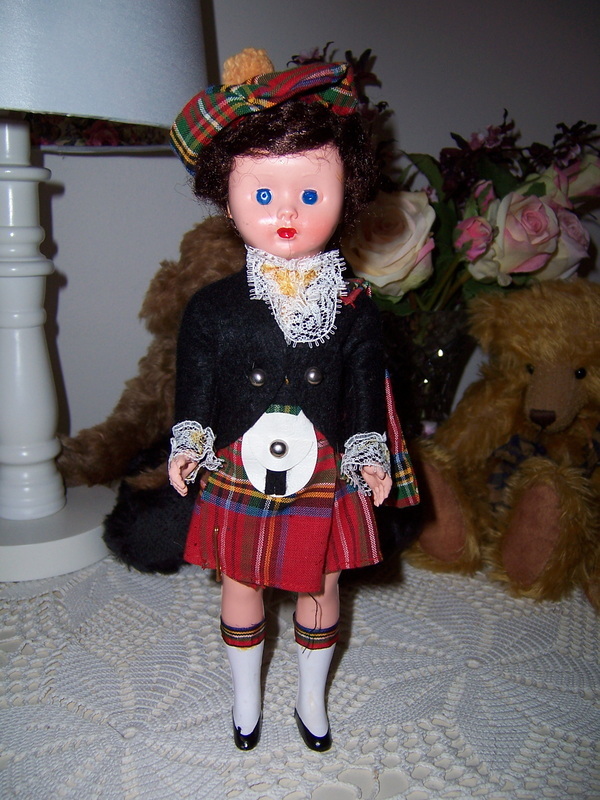 This doll is a little different to the usual Rogark dolls as they normally have legs and body all in one. The legs of this doll are movable, as are the arms. She has survived all these years and would be approximately 60 years old.